There was a time when learning consisted of three basic subjects: Reading, wRiting, and aRithmetic. The “3 R’s” as they were once known, taught a student all the concepts they needed in order to magnify their educational career. Today, those three subjects are still the basis for all other areas of learning. Helping students develop a love for those subjects is a goal that every teacher strives for. As the first of the 3 R’s, reading is immeasurably important to a child’s overall success in education, work, and in life. It is also an area that opens a new world of ideas, imagination, and innovation as the child begins to explore the things around them. Instilling a love for this most important of subjects begins at an early age so the ideas listed below will be most beneficial for 1st, 2nd, and 3rd grade classrooms. Reading to your students is one of the best ways to instill an early love of the subject. Bring your class together at a set time every day and read them a story. At the end, have your students return to their desks and display the questions included in the Author’s Purpose Gynzy tool on your interactive whiteboard. 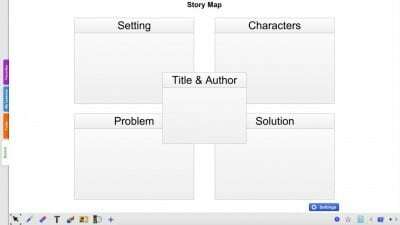 This tool is designed to help your students identify why the author wrote the story by asking them questions such as, “What is the author’s purpose in this novel?” For lower grade classes, use these questions as inspiration in order to create some of your own. The Author’s Purpose tool also helps you introduce the concepts of articles written for entertainment, information, and persuasion. If desired, assign your class their own writing topic and have them trade papers with a classmate. Then have each student answer the questions regarding purpose for their own stories. If you don’t have time to read an extra story as a class every day, you can always incorporate out-loud reading in your guided reading group. For more tips on how to create an amazing guided reading station using Gynzy’s interactive technology, visit this blog post on interactive whiteboards and reading. These questions can be modified based on grade level but even a 1st grade classroom can use this simple form. By incorporating a short book summary worksheet, your class will not only have the chance to work on their reading skills but on their comprehension as well. For a comprehension follow-up you can use with the whole class, try Gynzy’s Story Map that asks these questions on your interactive whiteboard. Using games in your lessons can help capture the attention of your class and teach them important concepts while they are playing. Incorporating reading games into your language arts lessons will help your class develop a love for words and stories. Below is a list of Gynzy games for your interactive whiteboard that your class is sure to love. Help them increase their phonics abilities with the Short or Long Vowel Words game. This activity will make reading easier for your students as they strengthen their phonics skills. A picture is displayed on the screen with a word below it. The word is missing one letter that your class will need to fill in. Help them select the proper vowel then talk about the differences between long and short vowel sounds so they can begin to recognize patterns on their own. Give your class the chance to see reading from the other side as they write their own story with Story Dice. This fun activity allows you to roll the dice to see what picture prompts come up. Help your students create their own story using the pictures as inspiration. Help students increase their reading vocabulary by playing the Synonyms and Antonyms game. Having an understanding of synonyms helps students not only become better readers but better writers as well. It teaches them how to use different descriptive words to complete a sentence rather than using the same word over and over. It also helps them grow their vocabulary as they gain an understanding of words with similar meanings. Creating a vocabulary journal for your class is another great way to help them strengthen their reading skills. Though your students may master the phonics aspects of reading and can sound out the words they encounter, they may not have a solid grasp of what those words mean. This will affect their comprehension skills and eventually lower their reading level. Make vocabulary journals for each of your students by giving them a simple notebook to store in their desks. Each time they hear one of the special vocabulary words you’ve assigned for the week, they record it in their journals. Older grades can write down the sentence in which the word was contained while younger grades can simply make tally marks to show how many times they hear the word in a week. These journals can also be taken home to enforce reading and vocabulary skills throughout the rest of the day or the weekend. Vocabulary journals will help keep new words fresh in your students’ minds as they look and listen for the words the rest of the week. In addition to the ideas above, incorporate interactive aspects into your daily reading lessons. Whether you play a reading game, listen to music with spelling words, or take turns reading out loud, providing interactive elements will help your students stay focused and have fun. Tape numbers to the bottoms of some of your students’ chairs before school or during recess. During reading time, have your students check their chairs to see if they are sitting in one with a number underneath. Begin reading the story as a class with the person who had the number ‘one’ under their chair read aloud first. Have each student with a number read a paragraph, a page, or a chapter depending on the length. The last student that reads should finish the selection you’ve chosen for that lesson. You can also sing songs that incorporate spelling words from the week. Make up simple songs to well-known tunes and sing them every day during your morning or going-home routines. This will help reinforce spelling words and improve their reading skills at the same time. While children learn the educational concepts behind reading during grade school, they can develop a love for the topic during their preschool years. Preschool, Pre-K, and Kindergarten teachers can instill a love for learning by reading aloud, talking about story plots, discussing main characters, and even acting out stories with puppets. Exposing young learners to reading can help them develop a passion for it as they grow older. It can also set them on the right path for future years of learning. No matter the grade level you teach, reading will always play an integral role in your students’ education. The subject is so important that intervention specialists are hired to work with those children who are below or in danger of falling below grade level. Reading is not only an essential part of good grades and success in school, it is also essential for a successful life. In addition to the many activities listed above, perhaps one of the most important elements in a child’s outlook on reading is your attitude. If you are excited about reading, chances are your class will be too. If you enjoy discussing the plots and details of your favorite stories, your class will also. The more you can demonstrate your love of reading, the more you can instill that same love in your class. It is the teachers that are most passionate about their subjects that make a lasting mark on their students. It is the teachers that are truly inspired about reading who end up becoming their students’ greatest inspiration.